The Florida State University Presidential Search Advisory Committee met Tuesday, December 1, and approved a list of three candidates to invite to the campus for interviews. The candidates will be interviewed by the committee and other campus and community groups this week. At the conclusion of the interviews, the Presidential Search Advisory Committee will forward comments to the university's Board of Trustees. Kevin S. Bedell — vice provost for research (2006-present) and John H. Rourke Professor of Physics (1999-present), Boston College. Formerly served as an adjunct faculty member in the Florida State University Department of Physics (1991-1995). Has been a fellow of the American Physical Society since 1993. Eric J. Barron — director, National Center for Atmospheric Research (2008-present). Previously served as dean of the Jackson School of Geosciences, University of Texas at Austin (2006-2008); dean, College of Earth and Mineral Sciences, Pennsylvania State University (2002-2006); and professor of geosciences, Pennsylvania State University. (1989); Received his bachelor's degree in geology from Florida State in 1973. Steven Leath — vice president for research and sponsored programs, University of North Carolina (2007-present). Previously served as associate dean of the College of Agriculture and Life Sciences, University of North Carolina (2005-2007); interim associate dean, College of Agriculture and Life Sciences, University of North Carolina (2003-2005); and director of the North Carolina Agricultural Research Service (2003-2007). The following meetings have been scheduled. Candidates will also meet with university administrators and deans. All meetings of the Presidential Search Advisory Committee will be available through live and archived webcasts at campus.fsu.edu/presidentsearch. In addition, the interviews will be telecast beginning tonight at 7:00 p.m. on FSU4. Telecasts will begin at 7:00 p.m. on Thursday and 6:00 p.m. Friday. For more information about the candidates, visit www.academic-search.com. 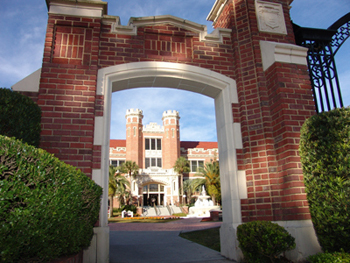 Click on the blue ribbon reading "Search Committee Login" in the upper right-hand corner of the page; the user name is FSUPresident and the password is seminoles.